What are mangrove forests and why are they important? How do local communities in mangrove areas benefit from them? WHAT? No Last Word? We welocme your comments and letter. The Consumers’ Association of Penang (CAP) urges the Perak state government to investigate and take immediate action to resolve the problem faced by about 500 small fishers in Kampung Sungai Tuntung, Panchor and Pengkalan Bharu near Pantai Remis whose livelihood have been threatened by aquaculture projects in this area. New project proposed in Tanjung Burung Forest Reserve at Kampung Sungai Tuntung, Pantai Remis, Perak. 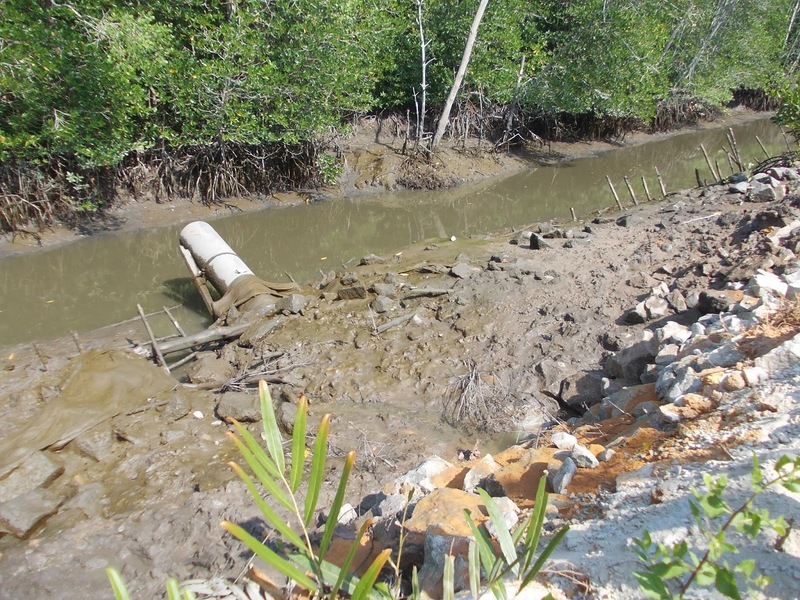 Besides threatening fishery resource and income of fishers, the shrimp and crab culture projects have also destroyed hundreds of hectares of mangroves in this area and have polluted the river and sea by discharging effluents from the ponds. 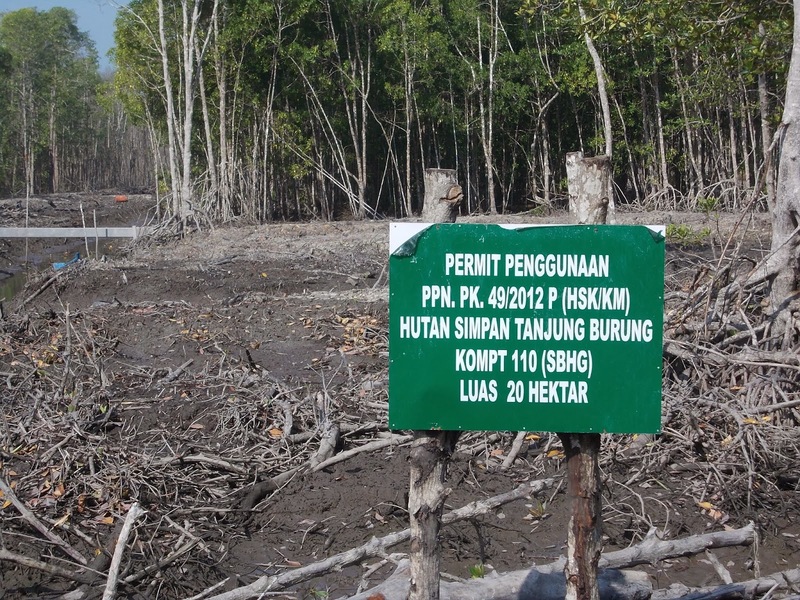 From a survey done by CAP, we understand from fishers that part of the mangroves that were destroyed to make way for aquaculture projects were originally permanent reserved forest i.e. Tanjung Burung Forest Reserve that should be protected and conserved. However what is happening now is that our natural heritage is being destroyed for aquaculture projects. Hence, CAP urges the Perak Forestry Department and Manjung District Land Office (Pejabat Tanah dan Galian Daerah Manjung) to investigate the complaint and make public their findings, especially to local fisher community regarding the status of the mangroves that have been affected by the aquaculture projects here. Nordin Mohd Hasim, 42, a fisherman here stated that since the aquaculture project started, their catch of fish and crabs have dwindled. Previously, the fishers here could get an income of more than RM200 per day but now at times they return home empty-handed or with a meager income of RM30 per day. Alias Said, 61, said that previously he could get a catch of about 20kg of ikan sembilang (eel-tailed catfish) per day but now if fortunate he gets only 5kg per day. He opines that if the destruction of mangroves continues fish and crabs which are the main catch here will become extinct and fishers will lose their source of income. CAP is disappointed that mangroves are continued to be destroyed and till now no effective action is being taken to protect them. CAP also urges the Fisheries Department, Department of Environment (DOE) and Department of Irrigation and Drainage (DID) to investigate this issue and take stern and appropriate action to resolve the problems faced by fishers here. Editor’s Note: This closed door system CP is using sounds closely related to an idea MAP has been pushing since 1996 when it recommended closed-system approach for shrimp farming. The problem is though that this approach does not really constitute a "closed system" approach as it should be devised. It still represents one end of an open system approach which is not sustainable. THAILAND - The disease has halved Thai shrimp production to about 300,000 tonnes this year. EMS caused serious damage to shrimp farming in China in 2009 and in Vietnam and Malaysia in 2010. It was first detected in shrimp farms in Thailand in late 2011. The toll of the disease is mass mortality of shrimp during the first 20-30 days of culture in grow-out ponds. CPF executive vice-president Sujint Thammasart expressed confidence that the close-door, biosecure system is an effective way to prevent disease and boost production. CPF's shrimp production is expected to increase from 30,000 tonnes in 2013 to 50,000 tonnes next year. "We forecast that both production and price will continue to rise after shrimp farmers solve EMS," said Mr Sujint, who oversees aquatic farming research at CPF. Editor’s Note: India may be increasing its production of shrimp now, and taking advantage of EMS forced reductions elsewhere, such as the 50% decline in Thailand's shrimp production caused by Early Mortality Syndrome (EMS). However this big boost in India production may come at a later great cost to those investing in this production surge, if EMS later strikes in India. It may well happen, as now EMS is seen in Thailand, Vietnam, Malaysia and Mexico. This jump to Mexico signifies the kind of rapid spread of these kinds of viruses. In any case, it looks like the US is still a number one importer and consumer of shrimp though the price increase and less reliable sourcing may dampen the appetite of many US importers and consumers. The problem with this "integrated system" of shrimp farming is that there is not enough area set aside for the stated purpose of creating a healthy mangrove wetland. It is like suggesting a field of potted mangroves will constitute a healthy mangrove forest. Healthy, functioning mangrove forests need a greater extent of mangroves than a mere 50% mangrove / 50% shrimp farm. The figures that mangrove experts have cited are more to the tune of 80% mangrove/ 20% shrimp farm, and in this way a more healthy, biodiverse ecosystem can be maintained while a still productive, but smaller-scale shrimp farm can be managed. I think this existing system has merits in reducing some of the big problems with shrimp culture, but it cannot really promise to bring back a healthy functioning wetland, and will in essence open the door to further degraded, partially functioning mangrove areas. WHAT? No Last Word? Write us!